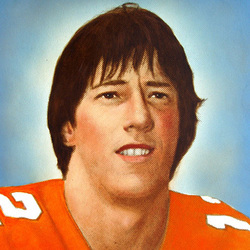 Jim Kelly began the quarterback tradition at Miami that led the school to be known as "Quarterback U." The names are almost as one: Kelly-Kosar-Testaverde-Walsh-Erickson-Torretta. He also was at the helm for perhaps two of the biggest games in UM history, beginning a turnaround that made Miami the most successful team in college football during the 1980's. As a 19-year-old freshman, Jim returned to his home state and made his first college start, leading Miami to a 26-10 upset at Penn State. Two years later, the same Nittany Lions came to the Orange Bowl ranked Number One and Kelly led the Hurricanes to a stunning 17-14 upset victory. That season Kelly earned MVP honors in Miami's first bowl appearance in 14 years, the Peach Bowl. Despite an injury plagued career, Kelly rewrote the Miami record books during his time at UM. Jim went on to star with the Houston Gamblers of the USFL, throwing for more than 5,000 yards in 1984, while earning league MVP honors. He moved to the Buffalo Bills in 1986 and rewrote their record books, leading the team to four consecutive Super Bowl appearances. He was named to the NFL Pro Bowl 5 times. He was inducted into the UM Football Ring of Honor in 2008.